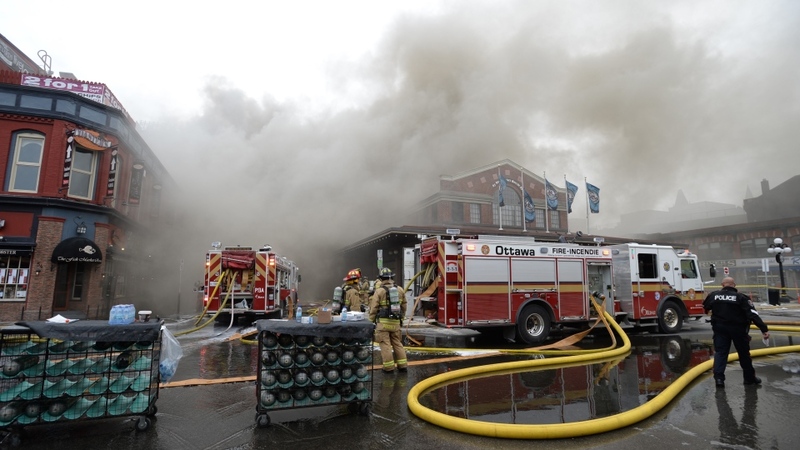 A massive fire has caused extensive damage to a popular restaurant in the historic ByWard Market. A blaze broke out at the Vittoria Trattoria Italian Restaurant on William St. at around 11:30 a.m. Friday. Work was being done on the roof at the time. The restaurant and other nearby buildings were quickly evacuated. Originally listed as a two-alarm fire, the blaze was eventually upgraded to a four-alarm fire at around 1:00 p.m. Most of the attack took place from outside, with ladder trucks dumping water from above. There were dozens of pieces trucks and other fire equipment on the scene. 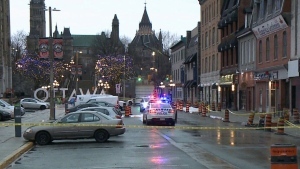 Much of the ByWard Market core was shut down to drivers, cyclists and pedestrians. Despite the dramatic scene, Fire officials urged residents to stay away. There were fears the fire could spread along the tightly-packed block of businesses in buildings that are more than 100 years old. No one was reported injured; both among the civilian population and among the firefighters who helped fight the blaze. By 2:00 p.m., the smoke had thinned considerably and firefighters returned inside the building for a more aggressive attack. 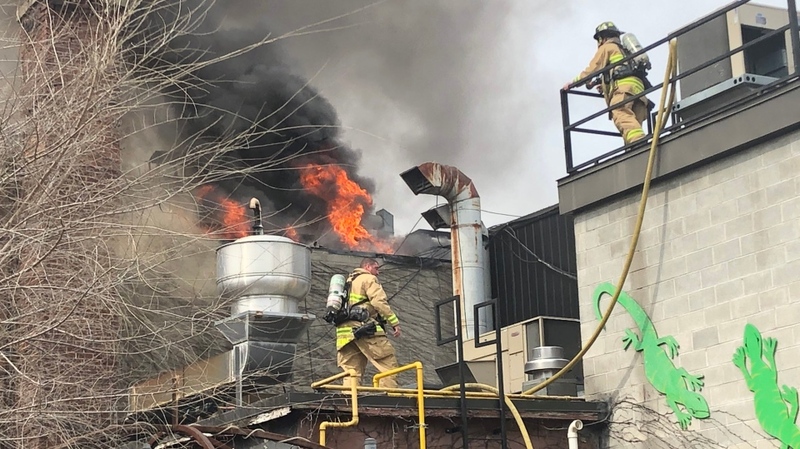 The fire was declared under control officially at 2:57 p.m.
Fire Chief Kim Ayotte said the roof of the Vittoria Trattoria did collapse while the fire was being fought, in part because of the amount of water that had to be used to fight the blaze. The two buildings on either side of the restaurant were also damaged. A release from Ottawa Fire later estimated at least $2 million in damage had been done. The cause of the fire remains unknown. An investigator will be examining the cause once it is safe to do so. 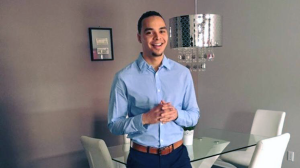 It will be a joint investigation between the Ottawa Fire Service and the Office of the Ontario Fire Marshall.